The O6 NPR One channel has been developed in partnership with NPR. 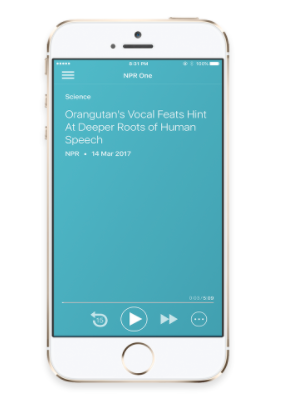 NPR One delivers rich, local, on demand, and personalized News, and Podcasts delivery. You can mark News or a Podcast as interesting using the Actions button, or skip to the next News item if you find it uninteresting. NPR One will learn your preferences and personalize the delivery of news. With NPR One you can rewind in increments of 15 seconds until the start of the current audio track, but you cannot go back to earlier tracks.